I make the orange-soy marinade right in a zipper bag, so I’m not dirtying up any extra dishes. I put the zipper bag inside an empty bowl to help steady it while I add the ingredients. To the bag, add the zest and juice of an orange, extra virgin olive oil, sesame oil, and soy sauce. Seal the bag and shake to mix all the ingredients together, then add the asparagus, seal again, and massage the marinade into the asparagus to make sure it’s all coated. Marinate for 30 minutes; during the last 10 minutes preheat your grill. Grill the asparagus over medium heat until crisp-tender, rotating every couple of minutes until all sides have a light char. Use the leftover marinade to baste the asparagus once or twice during grilling. When you remove the asparagus from the grill season it lightly with salt and pepper. Those charred crispy tops! It’s why I grill. Top the citrusy grilled asparagus spears with sliced green onions, orange zest and toasted sesame seeds. Serve with a side of rice and tofu, garlicky pasta, or veggie burgers. Mmmm, more please! In a large sealable bag, add the orange juice, zest, soy sauce, olive oil, and sesame oil; seal and shake to mix. Add the asparagus to the bag, seal and massage to coat. Let marinate for 30 minutes, flipping bag over halfway through marinating time. Preheat a grill to medium. 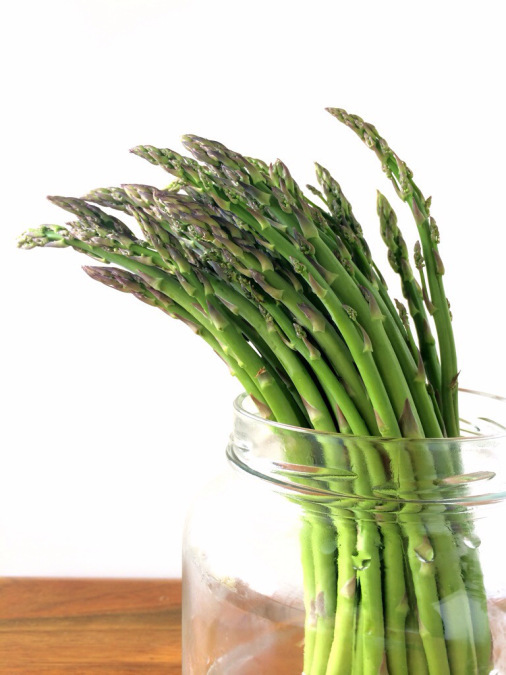 Remove asparagus from the bag and place on the grill, reserving liquid to baste asparagus once or twice through cooking. Grill asparagus until crisp-tender, rotating every couple of minutes. I grilled mine for about 10-12 minutes since they were fairly thick spears. Remove from grill, season with salt & pepper and garnish with extra orange zest, green onions and sesame seeds. Enjoy! Asparagus is, hands down, my favorite vegetable. Whenever it’s on sale at the grocery store, I buy several pounds and cook 1 pound each night to eat with dinner. And I eat the ENTIRE pound by myself! So I’m always looking for new ways to enjoy it. This orange glaze looks fantastic! I don’t have a grill, but I have a cast iron grill pan that Im’ sure will work just as well. Thank you for sharing. Me too – I love asparagus!! You could definitely use the cast iron grill pan and it would be awesome! Enjoy, and thanks! These pictures are stunning – want these now!! So simple and delicious looking!! I could totally eat a whole plate of those right now. I had to seriously refrain myself from eating it all – I had about half, which left the other half for my husband and son to split. 😉 Thanks!